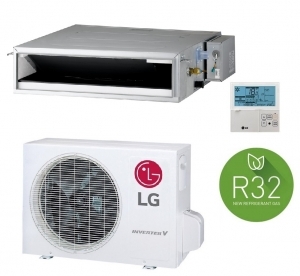 The LG CL12R.N20 ducted air conditioner and heat pump system comes with indoor ducted unit, hardwired controller and outdoor unit. This model is suitable for room spaces of up to 35 square metres and can either be fitted into a false bulkhead or above the room in a loft space via 150mm ducting. See details below in the pdf brochure on this new R32 refrigerant model.